Mugisa Clovis accosts his friends at the Special Hire Stage in Fort Portal with a frowning face. He has for the last 15 minutes been listening to Hits Fm – and going by the look on his face; he has heard some disturbing news that a one Tinfayo has ceded all his powers to manage his own farm to a cunning fellow called Magezi who has not only impoverished his benefactor (Tinfayo), but he had also turned him into his beggar! Mugisa goes ahead to engage his friends – who in unison agree that the inept Tinfayo warrants no mercy –as he should have suspended Magezi long ago. Such is the hotness of debate that has since emanated in the last few months of KRC using the imaginary story of a character called Tinfayo who owns a flourishing farm but is reluctant to demand from his farm manager accountability from the proceeds or how he is managing the enterprise. When he later realizes that the trusted manager is swindling all the proceeds, he decides to make desperate moves of making belated inquiries – which are quashed and disparaged by his now all powerful manager. 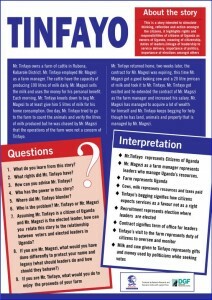 In a rather harsh and authoritative tone the now rich Magezi sends the impoverished Tinfayo back to his home claiming that by making him the manager he (Tinfayo) had surrendered all the rights to him to manage the farm the way he wished. But weeks later Magezi finds himself in dilemma when his contract expires. However being the shrewd and surreptitious man he is, he picks a small heifer and goes to appease his boss, Tinfayo. As expected the inept Tinfayo gets excited with the token given to him and renews Magezi’s contract!